OK so the first cover draft was not the best… Very ‘Seven Habits Of Highly Effective People’ – and there’s nothing wrong with that, it’s just not what we had in mind for ‘Love Me As I Am’. This book is about gay men reconnecting with their pasts, talking to their younger selves… writing letters and thinking… processing. So, back to the drawing board. The tagline also changed slightly… Rightfully so, because some of the stuff the contributors came up with was so powerful! We had it coming! 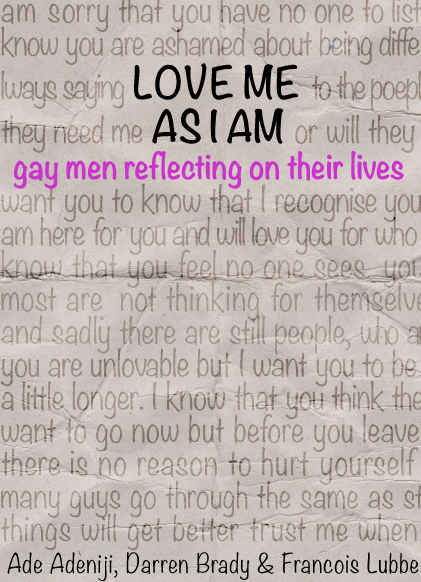 So, now we have ‘Gay men reflecting on their lives’ as a tagline. Much better! But is it perfect? The second cover-draft looks okay, it is certainly softer on the eye, but perhaps not as striking as we want it to be. Love the wrinkled handwritten letter and the font. The third cover-draft on the other hand is something really special. It incorporates everything in the brief: Not too pink, not too feminine, self-helpy or academic. It’s personal and intimate, yet striking and one would certainly see it from a distance on a bookshelf… A very good display item! We’ll put number three to one side… but just in case there’s some untapped designer genius we’ve not seen yet, we’ll ask for a few more cover options to choose from… Perhaps something with images, or photos and a pen… Yeah, a pink pen!